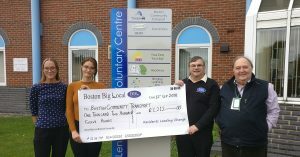 On Wednesday, the 12th September, we the residents of Boston Big Local presented the Community Chest Funding cheques to community groups who were successful from our July meeting. The lucky groups were Friar’s Folly, Boston Community Transport and Nacro who each required funding to keep their respective groups going. 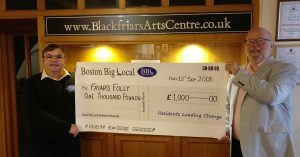 Friar’s Folly, as the name suggests in based in Blackfriar’s Theatre and meet on Friday afternoons to learn to play different instruments which are available to people who wish to start playing or even refresh their old skills. We gave this group £1000 to help with room rent and the hire of a facilitator. Boston Community Transport are based in the Len Medlock Centre and help people attend appointments, get around town in a way they would not normally be able to do with their service. 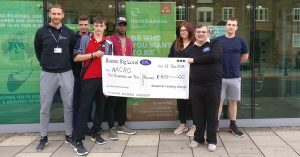 This group applied for and received £1212.30 to help with advertising their service. NACRO teach young adults between the ages of 16 and 19 a variety of skills from fitness, health and social care and functional skills from their base at the Haven Gallery in South square. Josh applied for a very specific amount of £612.30p for gym equipment to help all the students who attend the school develop their fitness skills. No Comments to "Community Chest Cheque Presentations"